There is a brief set-up narrration for each engine, then the cab ride itself is live audio only, so you experience it the way we did when it was shot. Lets examine these further. The first segment with 4-6-0 #1551 was shot during the time we got footage for "America By Rail-The Heatland" in 1994. However most of these were not used, since we had another camera there also. In this you will see good shots of the engineer, and fireman shoveling coal, as we make a run from Sugar creek to Baltic. Most of the views are from the firemans seat, plus a few others, like behind the engineer, and out the firemans side front window. Louisville and Nashville #152 was ridden from Frankfort to Midway, Kentucky in 1987 as it made a one-way trip from Louisville to Paris where it did excursions the following weekend. This was the last time the engine went on this route apparently. 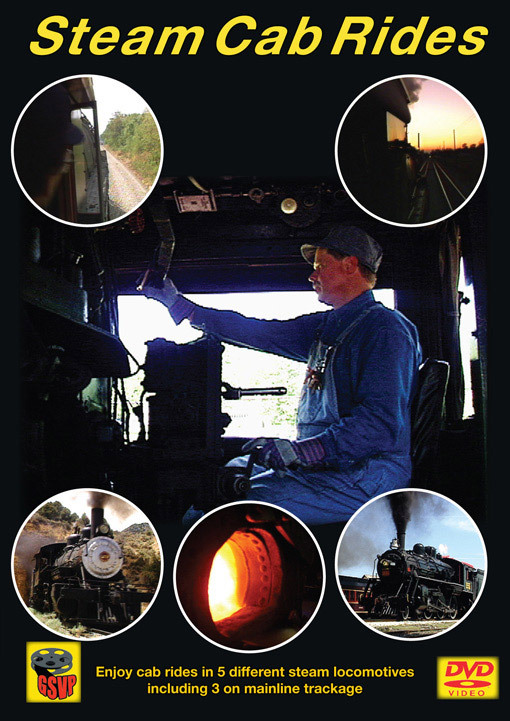 We see shots behind the engineer, and pilot engineer, plus quite a few views of the fireman shoveling coal. There is a tunnel we go through right away, and Jett HIll is a decent grade. A lot of the footage is shot hanging out of the gangway and you get a good taste of what it was like. The engine works hard on the grade and moves along at a good pace after topping the grade. This engine last ran on mainline trackage in 1988, and is now at New Haven, Kentucky at the Kentucky Railway Museum. In 1994 while working on the America By Rail show we shot the Virginia and Truckee 2-8-0 #29 out of Virginia City, Nevada. They were quite cooperative and we rode from Gold HIll back to Virginia City. The engine puts on a nice show, and we get to see views near the engineer, and fireman. This is an oil-burner but you see the fireman working the atomizer, and the engineer working the throttle and reverser. We also travel through a tunnel on the upgrade which is nice and we see them come into town. While the train is small and the distance only 5 miles, its a good segment. The line has been put back from Gold HIll to Carson City since our visit. We had the opportunity for a cab ride in Norfolk and Western 2-6-6-4 #1218 in 1987, as it made an excursion from Cincinnati to Danville, KY. We were only permitted to ride during the photo runby, but it was a double runby. We see engineer Bob Saxton, and fireman Kelly Lynch working the engine. Shots inside of the back-up moves, and then when the engine gets started(We see that inside), we shoot out the gangway looking down the boiler at the track ahead, as the engine accelerates. This is an impressive engine to say the least, and it only ran on the mainline trackage between 1987 and 1991. It is currently at the Virginia Museum of Transportation in Roanoke, Virginia. Award Value: 156 Points Earn points for free DVDs. Signup free. Steamboy (Revere MA US) on 2017-12-30 15:32:58. 1. The now-gone Ohio Central railroad with Canadian National 1551 was on Friday June 10, 1994 (Which was the day before my parents got Married). 2. L&N 152 over Jet Hill was on Friday October 9, 1987 (This segment was shown on Greg's Original 1988 editing of 152 Suspended in time VHS & Betamax, but not on the 2008 re-edited DVD version due to the engine's other '88 trips that Greg also shot). 3. Virginia & Truckee 29 was shot on Friday June 24, 1994. 4. 2 Photo Runbys with N&W 1218 on the Cincy-Danville line was on Sunday September 13, 1987. And number 5. Frisco 1522's return trip from Decatur-St. Louis as the final sunlight almost turns into the dark was filmed on Saturday October 22, 1988. With a unique mix of both Greg's JVC/U-matic & Sony Betacam eras, this was also one of the first Modern Steam videos with sound to include Brian Sellers' Narration. For Previews at the end of the new best of type video however, there are only 3 which includes Union Pacific Steam Volumes 1 & 2 From 1989, & the newly Released B&O Steam. So, Would I Recommend this New Best of Video from Greg? Well despite Brian's Minimal narration, one trackside runby for each engine is used in the brief profile is included, as well as Greg's trackside footages for his Cincy Railroad Club video with 1218 and 1988 action with 1522's first trips are defected with wet oil known as "Sticky Shed Syndrome" according to U-matic historians, I would definitley say go buy it. In other words yes, because many railfans are always curious to see what Greg shot in the first 5 years of his railroad video Business.